In Italy, and definitely in Sicily, citizens are most patriotic to the traditions and cultural practices followed within the sound of the church bell that they can hear, a concept called campanilismo. As a result, contrary to popular belief, only a handful places ritually eat seven kinds of fish on Christmas Eve. For example, in Bagheria, where my family lives, and where Chef Melissa Muller stopped on Thursday, Christmas Eve, it is their tradition to eat sfincione (or sfinciuni in Sicilian) the night before Christmas. 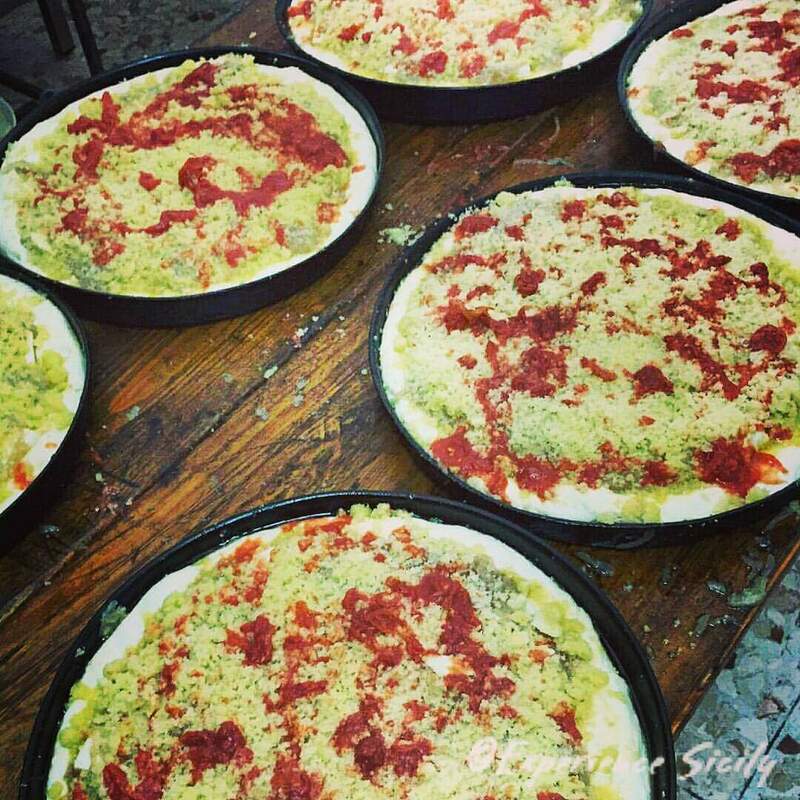 And more specifically in Bagheria, they eat, sfincione Bagherese, pictured here. Melissa Muller, who is the proprietor of Eolo Seasonal Sicilian Kitchen in New York City, took this photo of the flat bread baked with a sauce of tomatoes, anchovies, caciocavallo cheese, breadcrumbs, and oregano before the baker put them in the oven. I’ve eaten Bagherese sfincione many times, and as I look at this photo (that she sent me clearly to make me envious! ), I can imagine biting into this warm, thick, salty slice of soft, substantial doughy bread… which, by the way, Melissa reported was baked in an outdoor oven fueled by olive tree branches in order to give the it the most flavor. Just thinking about it takes my breath away. Sound good to you? Well, I invite you to experience Sicily through Chef Melissa Muller’s eyes and taste buds this May when we team up for “Experience Sicily with Chef Melissa Muller,” a tour of Sicily from May 19 to May 31, 2016. Experience Sicily with Chef Melissa Muller is a 13-day/12-night tour featuring the island’s traditional and contemporary cuisine, outstanding restaurants (many featured in her forthcoming book), remarkable UNESCO sites, hands-on cooking and wine experiences led by Chef Melissa, and interactions with the land and Sicilians who love it. Register for this outstanding itinerary today by emailing me at AllisonScola@experiencesicily.com. P.S. Catch Chef Melissa Muller on Sunday, December 27 at 2:00 p.m. on Channel 13 in New York, when she takes Mike Colameco through Sicily on Real Food with Mike Colameco. It’s my understanding also Dana that the gluten level is lower… Less GMOs perhaps? If you can take the chance, this sfincione is definitely worth it! I’ve heard it’s related to the GMO policies (like blocking all of them) in Europe, too! Yes, me too. Everything just tastes better in Sicily.